Hibernian and Falkirk both had to settle for a point following a Scottish Premier League draw at Easter Road. Strikers Steve Lovell and Michael Higdon both came close for the visitors in the first half. And Falkirk were the more enterprising side after the break, with Higdon hitting the bar with a powerful drive. Lee Bullen blasted over the Hibs goal from a promising position and Scott Arfield could not find the target with a snapshot from the edge of the box. The result extends Hibs' winless streak to five matches while Falkirk move two points clear of SPL bottom side Inverness. After a nervous opening to the match, Hibernian created a scoring opportunity when Derek Riordan crossed for Colin Nish to head off target. At the other end, a misplaced header by Chris Hogg presented Lovell with a shooting chance inside the box, but Hibs goalkeeper Grzegorz Szamotulski blocked well. Jonatan Johansson latched on to a long ball but could not get enough purchase on his shot as Falkirk keeper Dani Mallo claimed the ball comfortably. Riordan continued to cause the Bairns problems on the left as he got to the goal-line and cut the ball back before the danger was cleared. Falkirk defender Steven Pressley then headed over the Hibs bar from Burton O'Brien's in-swinging corner. The visitors threatened again when Tam Scobbie's deep cross picked out Higdon, but the striker's header looped over the crossbar. A neat passing move by Falkirk ended with Szamotulski tipping over Bullen's chipped ball from the edge of the penalty area. Hibs captain Rob Jones sent a header over the bar before the first half drew to a close. The Bairns continued to put Hibs under pressure at the start of the second half and Arfield's back-post cross found Higdon, whose shot strayed harmlessly across the face of goal. Higdon then struck the crossbar with a strike from 22 yards out. Seconds later, O'Brien's cross eventually landed at the feet of Bullen, who blazed over with the goal gaping. Arfield shot wide from the edge of the box with 11 minutes remaining as Falkirk's frustration continued. Mallo tipped over from substitute Denes Rosa's deft cross and Hibs struggled to create openings in the closing stages. "In the first half, I felt we had a couple of breaks and a couple of good opportunities if our passing was that little bit better. "In the second half, I felt we controlled the game. We gave them one or two chances because of sloppy play. "All in all, we just huffed and puffed and never really created a clear cut chance, which was disappointing because I felt we had players up front who could score goals. "You have to give Falkirk some respect. They might be second-bottom of the league but they're a good team, they have fantastic players, they work very, very hard and they've got loads of experience. They make it difficult for anybody. "I'm disappointed we never really got behind them and really created chances and got that all important first goal." "I'm disappointed to draw the game because we wanted all three points but it wasn't to be. "I felt we were the better side in both halves. Obviously Hibs had bits in pieces. "I think we had the better of the chances. Lee Bullen had a right good chance, Michael Higdon hit the bar. "It was a good game. I'm really pleased for my boys, it's a hard place to come and take a point. "But if I'm honest enough, I think we should've taken three points. "From now until the end of the season I don't think we're going to pull 10 or 15 points away from Inverness, it's going to be nip and tuck. "We're going to have to get battling performances like that, matched with a good bit of football just to keep ourselves above water. "And if they keep giving me that every week then I'll be a very happy guy." Hibernian: Szamotulski, McCormack, Hogg, Jones, Stevenson, Johansson (O'Brien 61), Bamba, Keenan (Rosa 64), Nish, Riordan, Fletcher. Subs Not Used: Ma-Kalambay, van Zanten, Thicot, Rankin, Chisholm. 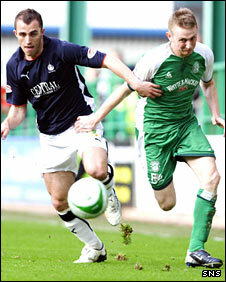 Falkirk: Dani Mallo, Bullen, Barr, Pressley, Scobbie, Arfield, Riera (Lynch 74), Cregg, O'Brien, Lovell (Stewart 90), Higdon. Subs Not Used: Olejnik, Finnigan, Holden, Aafjes, Mitchell. BBC Sport Player Rater man of the match: Falkirk's Scott Arfield 8.00 (on 90 minutes).